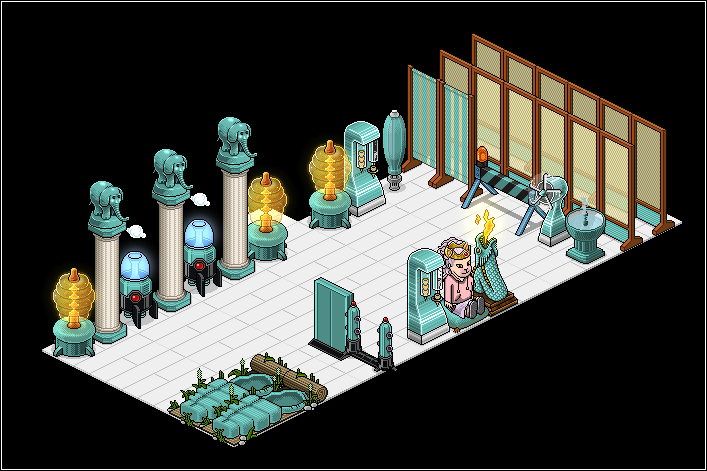 The month opens with some banging new furni, courtesy of another crackable. It’ll set you back 75c+d apiece if you want these chests, and while you could end up getting something crappy (Teal Road Barrier is already at minimum possible price on MP!) you could also find yourself in possession of something really beasty – the Teal Dragon Lamp, which at the time of writing is selling at around 600c! The shiny shiny boxes are only around for one day it says, although it’s worth noting that this isn’t strictly true – they will be released for 24 hours at a time, a few times through the month. 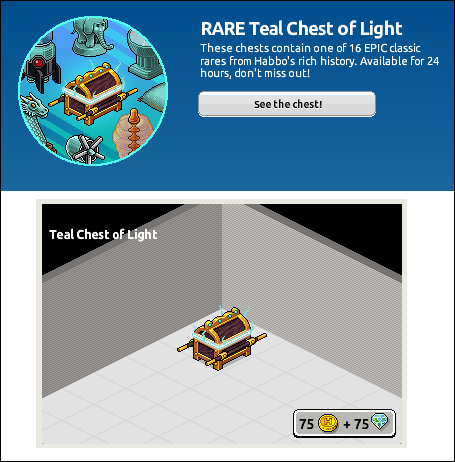 One of sixteen rares will come out of the chest if you smash it open, you could get a Marquee, Smoke Machine, Fountain, Oriental Screen, Parasol, Sleeping Bag, Doric Pillar, Amber Lamp, Elephant Statue, Spaceship Door, Ice Cream Maker, Powered Fan, Laser Portal, Road Barrier, Pillow, or Dragon Lamp! Pretty decent list there, quite a lot of variation. Moooooost of these are actually worth rather a lot less than the chests cost, but the Dragon Lamp, Ice Cream Maker, and Pillow will all net you a profit if you’re lucky enough to nab one! So little Habbos, what do we think? I personally reckon it’s a lovely colour and could go with a few themes or sets, so I’m a fan. Not much of a gambler though so my chests will remain unopened to sell 😛 What are your favourites, and are you stocking up? There’s a forum thread here for discussion on these as well as the upcoming Zen Garden collection!